Venus presents a special challenge to space explorers. Yes, there is a surface, but hellish temperatures and atmospheric pressure on the surface of Venus has a tendency to crush spacecraft fairly quickly. Short of building a submarine-rated surface explorer, maybe there’s a better way to look at the hothouse planet? A newly proposed NASA concept suggests using airships. Yes, airships with people in them. But as you will see below, balloons and airships have been discussed extensively in the past decade by NASA and the Europeans as the best way of exploring Venus without needing to touch its hellish surface. Venus may seem nothing but a distraction to an agency that is talking about exploring Mars in the 2030s (with Orion’s recent uncrewed test being the first advertised step of that, although critics say it won’t get us to the Red Planet). Leaving that aside, however, exploring Venus by balloon is not a new idea at all, even within NASA. The backers of the High Altitude Venus Operational Concept (HAVOC) even argue we should head to Venus before Mars, as one of the co-leads recently told Universe Today. The proposed flight profile of the HAVOC airship at Venus. Credit: Space Mission Analysis Branch, NASA Langley Research Center. The clouds of Venus, Jones said, present an ideal spot for humans to roam from a spacecraft. The conditions at 50 kilometers (31 miles) above the surface are about the same pressure and atmosphere as Earth. There also would be more solar power and protection from radiation than Mars, and the temperature — although fairly hot — would be possible to account for fairly easily in spacecraft designs. Jones provided some details on how the crew would spend about 30 days exploring the planet after a journey there and back (440 days total). Bear in mind that the mission is just in the early stages of even thinking about development. Cost, timeline, approvals and many other hurdles would need to be overcome before it could even become a reality. Details of the proposed HAVOC airship mission to Venus. Credit: Space Mission Analysis Branch, NASA Langley Research Center. The concept arose from science objectives for the planet out of NASA’s Venus Exploration Analysis Group, Jones said, whose aims include understanding the atmosphere and its interaction with the surface. NASA’s Langley Research Center also has human objectives they considered, such as showing how people can work in deep space and develop advanced technologies to accomplish that. The proposed Venus exploration plan for HAVOC. Credit: Space Mission Analysis Branch, NASA Langley Research Center. The HAVOC mission would start with a series of phased exploration sorties. 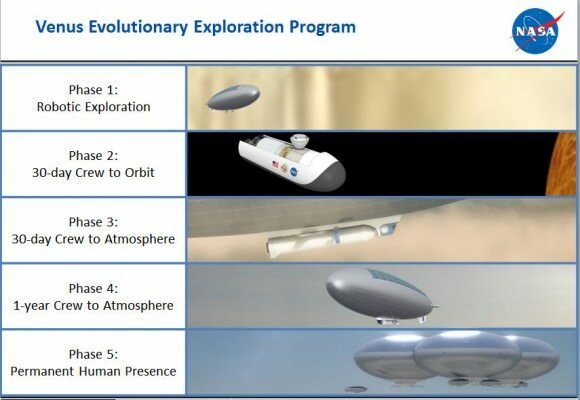 The first phase would be examining the Venusian atmosphere with a robotic mission, and the second would be crewed ride to orbit that would include deploying an uncrewed robotic airship in the atmosphere. The third phase is the 30-day mission described above, while the fourth phase could potentially be as long as a year. If it gets to a Phase 5, that would be a “permanent presence in Venus’ atmosphere”, Jones said. A size comparison of ships for the proposed HAVOC mission to Venus. Credit: Space Mission Analysis Branch, NASA Langley Research Center. Of note: balloons have been discussed before within NASA, particularly by Venus exploration advocate Geoffrey Landis of NASA Glenn, and Jones told Universe Today that this new team found much inspiration from Landis’ previous work. Universe Today interviewed Landis in 2008 about missions he proposed about human-colony airships and uncrewed solar-powered airplanes. And in this 2010 study, he suggested three ideas for exploring the surface using uncrewed low-altitude balloons. One would skim the clouds around 25 kilometers (15.6 miles) and two other concepts (more rigid, naturally), would fly about 5 kilometers (3 miles) high. This was presented at an American Institute of Aeronautics and Astronautics meeting that year. Landis was also not deterred by harsh surface conditions. While Venus’ surface is difficult — its 480 Celsius (900 Fahrenheit) thick atmosphere destroyed the Soviet Venera probes in minutes — he’s secured early-stage NASA funding for a robotic landsailing rover concept nicknamed “Zephyr”. “Sailing on Venus! How cool is that? 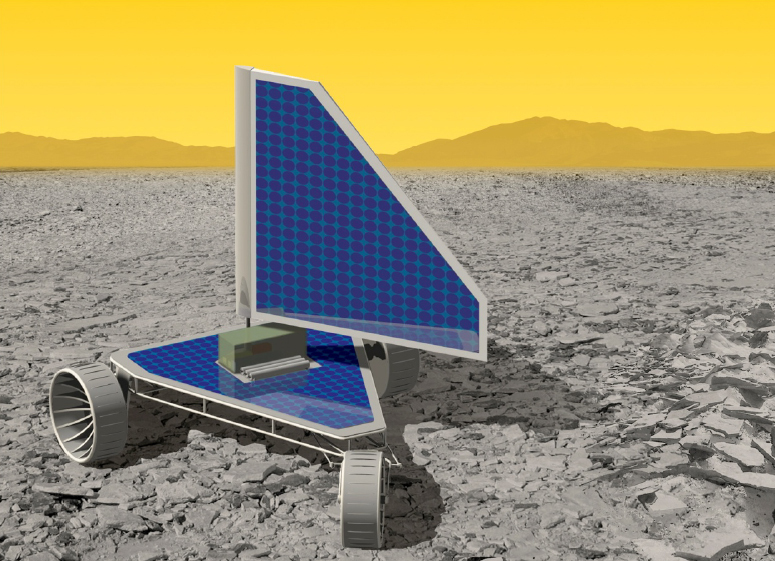 The project will have an exceptional public engagement factor,” the description page for the Venus Landsailing Rover reads. In a nutshell, Glenn has created electronics that can continue to function in temperatures similar to what are found on the surface. Simulations also show that solar cells would work, albeit at reduced efficiency. Hence the idea to use a heavily-reinforced landsail to take advantage of Venus’ 100-times-more-pressure-than-Earth atmosphere at the surface. Wind speeds are less than a meter of second, but have terrific force behind them. And at least some of Venus appears to be flat, with rocks only a centimeter thick in pictures from Venera. Balloons have also been considered by the European Space Agency, particularly in the form of an uncrewed Venus Entry Probe discussed in detail in this presentation by Surrey Satellite Technology Ltd. It would include a Low Venus Orbiter that would map the planet to complement closer-to-ground measurements, a Venus Relay Satellite that would send information from the balloon, and the “aerobot” itself. “The aerobot consists of a long-duration balloon and gondola … that will analyze the Venusian middle cloud layer at an altitude of ~55 km, where the environment is relatively benign. The balloon will deploy a swarm of active ‘ballast’ micro-sondes, which, once deployed, will determine vertical profiles of the lower atmosphere,” the presentation reads. More detailed information is available from this 2004 ESA workshop presentation by Surrey and this ESA webpage, which says the study was completed in 2005. Students have even explored Venusian balloon ideas, such as in the 2014 Summer School Alpbach cosponsored by the European Space Agency. An uncrewed idea called EvolVe suggests a joint orbiter and balloon mission to see how tectonic activity and volcanoes affected the surface of Venus, among other scientific goals. The balloon would hover in the same general region, about 50 to 60 km (31 miles to 37 miles), and probe the surface using radar and other tools. It’s one of two concepts selected for further investigation that could lead to a science conference presentation and/or science journal publication. This, together with so many other phantasies during the last year, defines UniverseToday as an anti-scientific sci-fiction site. Nothing they talk about these days, will ever happen. And they don’t care. That’s a bit sad, and ruthless, because they are fooling people and kids. You really are against everything, aren’t you? No not at all! I’m just against the confusion of never working sci-fi dreams on the one hand, and real engineering progress on the other hand. An airship on Venus won’t fly. I’m telling you. When on your deathbed, hopefully 50+ years from now, you can verify that I informed you correctly. Oh really? What is it about the idea that you consider technically unfeasible? I can see this project not going anywhere if money or the political will is lacking, but from a scientific view there is nothing to prevent airships on Venus. I remember people telling me the complicated landing procedure for the Curiosity rover wouldn’t work. People told me the Philae lander would never succeed. Same with Cassini/Huygens. All these were accomplished, and seem more remarkable to me than filling a big balloon with gas and floating it in a thick atmosphere. Well, give me a call when first human crew enters the Venusian atmosphere in a balloon. And survives to tell us about it. “An airship on Venus won’t fly”… what makes you so sure about that? The acid clouds?? Come on, chemistry did come up with some fine material which are “immune” against acid’s attack. I cannot understand why you continue to bash Universe Today and call them anti-anything. They are a reporting channel. If, for instance, you felt that Elon Musk’s idea of Hyperloop transportation was unfeasible, would you then bash NBC News or The NY Times (they also wrote about NASA’s faster-than-light research) for carrying a story about it? Universe Today didn’t create this concept; NASA researchers did. If you feel you absolutely must vent your feelings, then call NASA “unscientific” and a sci-fi organization. If you want only peer-reviewed scientific articles then stick to the professional journals. Instead of a manned Venus mission, I’d prefer a long series of unmanned supply ships, perhaps 20-30, to pre-place food, volitiles, construction equipment and difficult to replace hardware, into both Mars orbit, and surface, for use by future manned expeditions. Alas, man seems to rarely plan that far ahead. I’m not sure why these are alternatives. Almost every Mars mission proposal includes some use of robotic supply vehicles to preposition supplies, return fuel, etc. But there’s no point in doing it until you know what mission you are planning, what supplies it will need and where, what tools will be available to access the supplies and so on. In any event, doing advance planning and design for a range of Mars, Venus and asteroid missions seems sensible. We can pick a short list in a few years and try and share design work between them. Premature? Maybe, but a good thought experiment anyway. These exercises are beneficial in that they can act as a ‘seed’ for further mission development. I’d like to see more, but with robotics instead of a human crew. At least at first. Our computer savvy is evolving quite nicely with quantum circuitry just over the horizon. The idea of seeding Venus with modified microbes to reduce CO2 in the atmosphere into oxygen may eventually make sense? But certainly not with today’s limited information about the planet’s geomorphology. SciFi short story subject? We explore Venus and find a way to use microbial reduction to partially reduce Venus’ atmosphere to 1/16th it’s current mass/volume. The now available carbon feeds bio-engineered algae which grow rapidly, forming huge mats which cover the flats and low lying areas. Free oxygen levels continue to rise as the algae locks up excess carbon. Human volunteers are genetically modified and gradually incubated into Venusian atmospheric conditions on Earth. Meanwhile, surface infrastructure has been autonomously constructed and awaits their arrival. Initially the surface suits worn are hard shell and nearly indestructible. Later they become more like mirror coated modern spacesuits then continue to evolve into progressively lighter and thinner simple excursion suits. After some two thousand years, protective covering is no longer required.. but wear your sunscreen! Addendum: There may be a child alive today who will wear that sunscreen! Simply photosynthesising out the carbon won’t reduce the total atmosphere mass enough. CO2 is 32/44 oxygen by mass. You need to get most of that oxygen out of the atmosphere as water, ice, solid CO2, rock or lost to space. What I wonder is what scientific research that an airship with a human crew could do in the Venusian atmosphere that a robotic airship couldn’t. It’s easy to see how direct human presence would be valuable for exploring Martian geology. It’s harder to see what good it would do just floating around in the air over Venus.